August 8, 1924. "Stewart Shortt, John Ayers, Eliott Smith at White House." Who seem to be bicycling to Atlantic City in August. Might want to loosen those bowties, boys. National Photo Company glass negative. View full size. Submitted by stanton_square on Sat, 04/05/2014 - 5:44am. Baltimore Sun, August 11, 1924. —Expect To Go To Atlantic City. Three boys who are advertising their city—Petersburg, Va.—arrived in Baltimore yesterday. 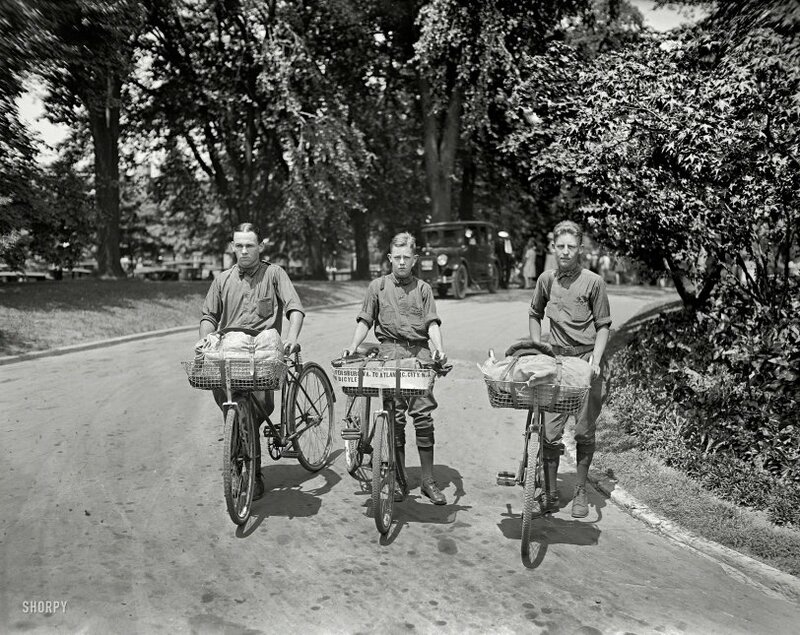 They are making their tour on bicycles and have visited Bowling Green, Fredericksburg, and Alexandria, Va., and Washington. They plan to complete the trip August 20, when they expect to arrive at Atlantic City. Today the boys—Stuart A. Shortt, Elliott A. Smith and John W. Ayers—will visit Mayor Jackson and A.S. Goldsborough, executive secretary of the Baltimore Association of Commerce. They are carrying pamphlets explanatory of Petersburg's growth as an industrial city. Their visit to Baltimore will be lengthened in order that Shortt may receive treatment from Dr. William S. Baer for an injured leg.